It is Gabe Chang-Deutsch’s second year at south and he's returning as sports editor for his second year on the Southerner. After spending his 9th grade on the team, the Southerner and Chang-Deutsch are inseparable. He enjoys the freedom newspaper gives him to write what he wants to write (within reason, of course) and investigate what he finds interesting. In Chang-Deutsch’s own words, newspaper is “THE class”, and he credits it with helping him become a better writer and a more curious person. But his favourite thing about newspaper is the people he reports with. Chang-Deutsch likes his ceramics class, as well as his writing classes, which help him in newspaper and visa-versa. 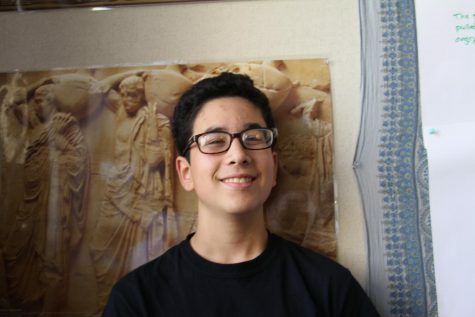 Outside of school, He enjoys going to debate, but he has a particular passion for physical activities. When he’s not in school or studying, he’s moving. He enjoys rock climbing, as well as biking. And to complete his well-roundedness, he plays guitar. Chang-Deutsch is looking forward to his sophomore year and continuing to rock the southerner.